Cryoport's liquid nitrogen Dewars combine with an experienced team and a cutting edge logistics management platform to provide a powerful end-to-end cold chain logistics solution. 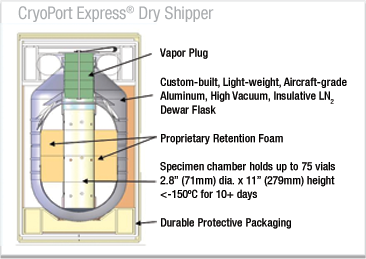 The CryoPort Express® Dry Shipper uses dry vapor liquid nitrogen (LN2), eliminating dry ice and reliably delivering your materials to their destination. © Copyright 2014 Cryoport Systems, Inc.